The fuel cost increased to around $4.00/gallon as we made the return trip home. We arrived back home on Saturday afternoon, we stayed in Monroe Michigan on Friday night. We returned into Canada via the Ambassador Bridge in Windsor for the first time, it was a trouble free crossing. We cleared customs via the truck lanes (a mistake!) but we were passed through without problems. The Windsor crossing is much easier than transiting Detroit and going to the Sarnia/Port Huron crossing. The RV furnace was run overnight to keep the pipes from freezing, the anti freeze was put in yesterday. Trip stats will be published in a few days! We are in the Fireside Campground outside Garrett, our normal stop on the way south and north. Last night we stayed in Columbus and we were in the trees, hence no postings. It's down to single digits, it's about 5C outside the camper, we are glad that we topped up a propane cylinder yesterday in Columbus as the electric heater isn't keeping the temperature up in the camper because of the wind. We looked at the local weather back home, a couple of inches of snow are forecast for Friday so we will come back to a white lawn. 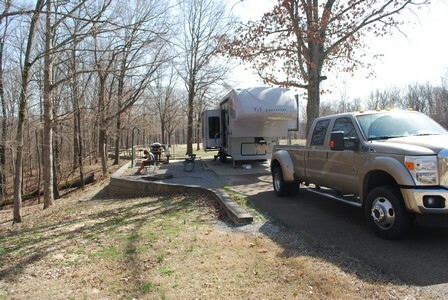 We are in the KOA in Bowling Green Kentucky. Yesterday and today have definitely been indoor weather with daytime temps around 10C and breezy, the weather here in Bowling Green indicated snow overnight, we are not sure if it occurred or not. As a result the shorts, short sleeve shirts and crocs have been retired in favour of jackets, sweaters, shoes and socks. It's amazing how much cooler the weather is just 2 weeks ahead of our normal return date. Just as a precaution, some RV anti freeze will be bought here at Camping World if we need to winterize the camper before we get home. As usual, Kasey is enjoying the dog park here, he has almost completely returned to his old self! We moved here today with an easy drive through Memphis. Back in Village Creek we enjoyed our stay, we didn't have any severe weather (other than some heavy wind) as a result of the tornadoes north east of us. Thanks for the E-mails of concern for our well being. When the cold front went through yesterday we went from around 80 F during the day to frost overnight, here in Natchez Trace it's about 13 C and a bit windy, I think that these are normal temperatures for this time of year. We are here for 2 nights then it's on to Bowling Green! 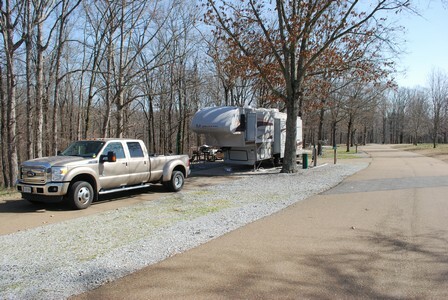 We arrived here yesterday afternoon from DeGray Lake State Park in western Arkansas. 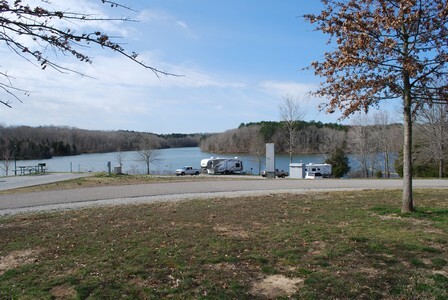 We normally stay at DeGray Lake for one night (as we did this time), but because the campground we normally stay at was closed (we are a couple of weeks earlier returning this year) we were placed in a site right on the lake, substantially better than the sites we normally stay at. We recorded the site number and will ask for it when we return in the fall. 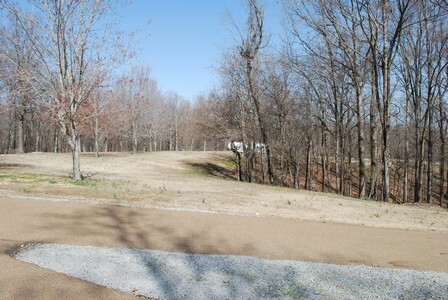 It's also very quiet here at Village Creek, we are one of only two campers in the park! Too bad for the locals, the weather here is great (highs in the mid 20's C and sunny). The lady at the park office indicates that the place is starting to book up for the March break weeks, which is good as she says the winter has been a little "slow" here. 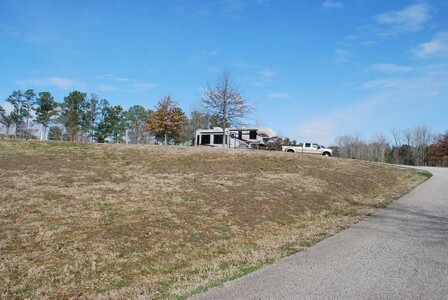 We will stay here for a total of 3 nights and head out to Natchez Trace on Saturday, meanwhile we will have a second campfire tonight (and some rib eyes on the BBQ!!). A view of our only neighbour. Also the grass is still very brown except for the wild onions! 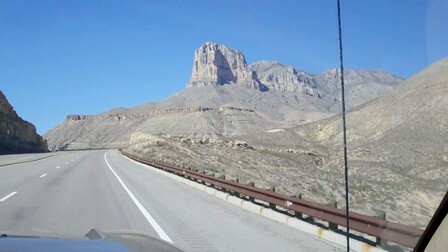 We took a movie on the drive through the Guadaloupe Mountains back in Texas, the picture below is a snapshot from it. If the movie isn't too big, a link will be provided. 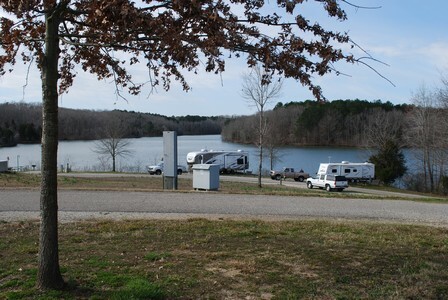 We arrived here in this state park near Mount Pleasant Texas yesterday afternoon and have been enjoying the weather. The grass is green and the temperature has been great, Kasey has also seen a few deer and has let us know where they are. We enjoy this stop and we will move on to Arkansas tomorrow. We are in Ranger Texas today, after we enjoyed lunch with Chuck and Wanda in Deming on Tuesday, we stayed in Rockhound overnight and left for Carlsbad on Wednesday morning. Because the road construction is still continuing in Carlsbad (and we were tired!) 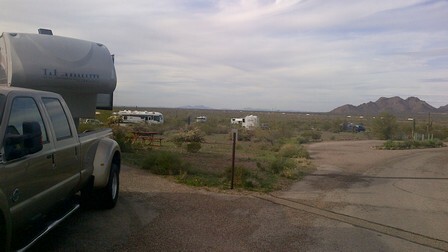 we stayed in an RV park just west of town, it looked like an older KOA that has been around for a while. It wasn't bad for a one night stay, and the laundromat was convenient. A determination of the campground age could be made from the fact that the 50 amp service pedestal had fuses instead of breakers!. Everything worked though. On Thursday we made the short run to Monahans Sandhills State Park. Both Wednesday and Thursday were inside days due to the high winds, in Monahans the winds blew sand around the RV, covering the pavement and requiring the windows to be closed and running the air to keep the RV cool (daytime temperatures were in the high 80's F). Kasey doesn't like the wind and the trailer was rocking overnight, he upchucked a few times, he hasn't returned to normal yet. We hope that staying here in Ranger for two days will return him to normal. A cold front came through south Texas overnight, the temperature was 32F this morning when we got up in Monahans, but the wind had died down. As a result of the high winds, the internet dish wasn't set up so we have been off-line, here in Ranger we are catching up on news and E-mails. Suzette took a short video of the Guadaloupe Mountain pass area, it will be uploaded and posted, some great scenery! On Sunday we will make the transit through Dallas/Fort Worth, and head for eastern Texas. We departed Lazy Days this morning and made the run (easy miles) here to Deming. We gained some altitude (Deming is about 4,600 feet above sea level) so it's a bit cooler, there is some snow on the hills above us. Its going down below freezing tonight, it's the first time in a while we've seen these temperatures. Al hasn't disconnected the water hose outside, we will see if it freezes up! Incidentally, Lazy Days refunded the full cost of the water heater repair that was done improperly before Christmas as well as a portion of our camping fees for the stay. They are trying hard to please their customers. We plan to Meet Chuck and Wanda for a lunch in town tomorrow, then on Wednesday we will head towards Carlsbad NM. Someone must be reminding us of the weather back home! A cold front came through earlier today with some fairly heavy rain, some sleet and a dramatic decrease in temperature. It's about 5C outside the trailer and for one of the first times we see the vapour from the stack and the cooling towers of the power plant in the distance. The weather forecast indicates an inch or two of snow in Benson which is nearby. It will warm up tomorrow but it's a shock! At least the dust got washed off the truck and the trailer. It's not a bad site but Lazy Days has dropped the ball. Pre-Christmas the facility was starting to be whipped into shape after it re-opened after the former Beaudry facility was closed for a year or so. We expected further improvements when we returned.... not so! The premium sites that we are using were dry (no irrigation) and overgrown in the fall, now the irrigation is on but we get sprayed with water about 3 times per day (the water was turned on but nobody checked the aim of the sprinklers or to set them to water overnight (and save water!). no additional work has been done to make the ongoing small repairs that are needed in a facility of this kind. They do pick up your garbage at each site now, but it sits for 2 or 3 hours rotting in the sun before the guy comes by, it would have been better to leave it as before (dumpsters throughout the park). Lazy Days has seem to have done a phrase that Al remembers from the machinery repair business, an "instant overhaul". They painted the exterior of the buildings and quit! What is seen is a bloated management structure with lots of Florida folks in shirts and ties, a complicated computer system (it took the staffer 5 minutes to input a transaction in order that we could pay for a propane cylinder fill! ), in short lots of chiefs with nobody doing the work or more importantly, checking the details that are required to make an operation successful. In addition to the above, we have a problem with our washer/dryer and we called a technician in Tucson to come to the site and have it repaired. Lazy Days won't allow the technician to come onto the site to repair it!! Suffice it to say that we won't be back here if we can find a suitable site somewhere else in Tucson next year. From what we see, the facility won't survive if it's managed as it is now. 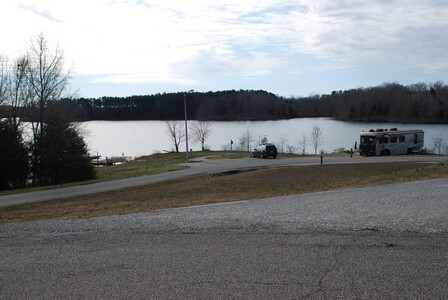 We will move to Rock Hound State Park next Monday. 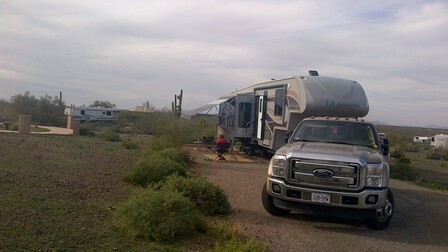 We returned to Tucson after a short run from Picacho Peak SP. We have settled into a premium site and we will be here for a week. We will do some shopping and touring around during our stay. They still haven't installed the hot tubs at the premium sites yet, Suzette isn't a happy camper! 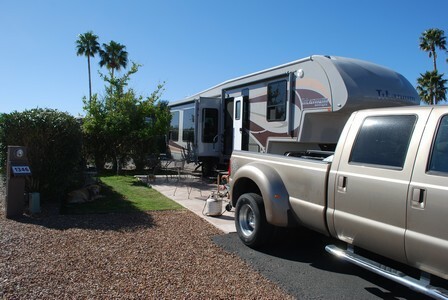 We arrived here this afternoon after a longish drive from the Blythe California KOA on the Colorado River. We stayed there last night after an interesting drive from Borrego Springs. 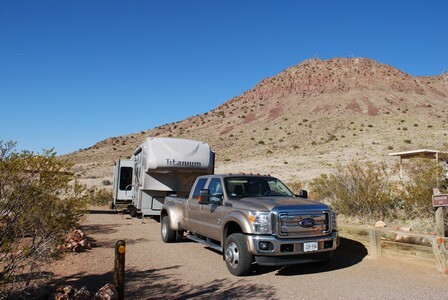 On the way over to Blythe we went through an area called Glammis which has sand hills that are ideal for RV boon docking and off road activities. The stay at the KOA was uneventful, Al was lazy and didn't erect the satellite dish. The internet provided by the KOA was basically DOA, it kept dropping on both the computer and the Blackberry Playbook between web views. 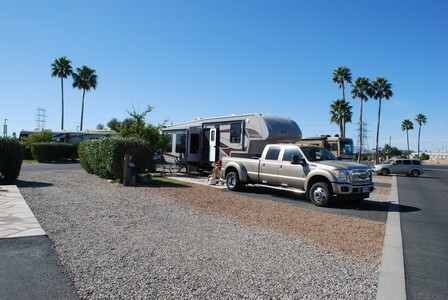 The transit on I-10 was interesting, it's the first time that we've seen Quartzsite, it's amazing seeing the number of RV's there, we are not sure if it's a place that we would want to stop at, other than buying some RV stuff. 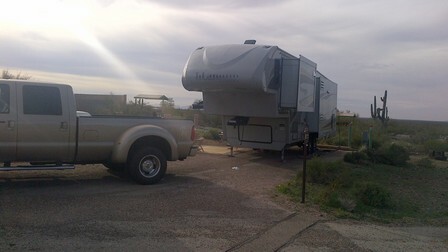 We are here in Picacho for two nights, then we will make the short transit to Tuscon where we will enjoy a week. We will enjoy the break from the driving and we look forward to Tucson!